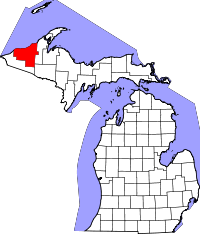 Ontonagon County, one of the largest counties in Michigan as far as land area, yet one of the smallest as far as population, has a similarly small vital records research area with the County Clerk in the Ontonagon Courthouse. Only one researcher can fit in the office at one time; the office is open Monday through Friday, excluding Wednesdays, from 10:00AM until 3:00PM. While birth and death records are both indexed from 1868 to the present, only birth records dated older than 1902 are available for public viewing. Marriage records are also available from 1853, and divorce records from 1856, with both of them listed to the present. Despite what seems on the surface to be a fairly large county, almost 65% of Ontonagon County is comprised of water. It is located in the northern half of Michigan, bordering Lake Superior and also containing Lake Gogebic, the biggest lake in the top half of the state.